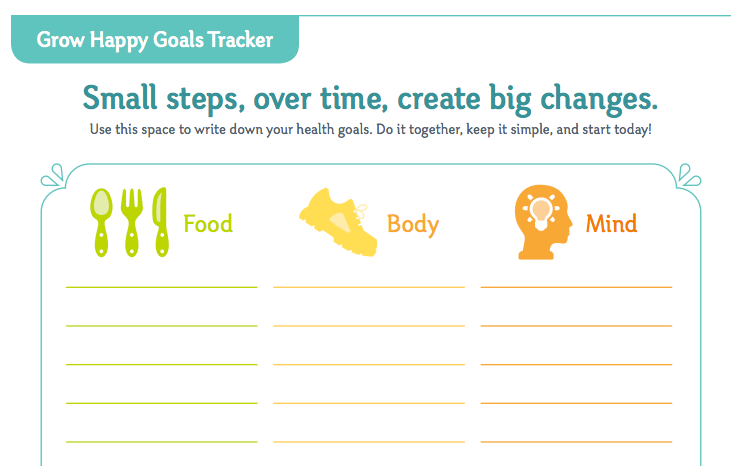 Free Printable Goals Tracker & Free Registration at Knowledge Universe Open House Events! Do you set family goals? Steve and I are both very active ‘goal setters’ for all the areas of our lives. We have our personal goals, our parenting goals, our financial goals and we’ve started including the boys in our ‘family meetings,’ where we talk about our week, our schedule and what things we’re wanting to do more of each week. The boys’ goals are simple, but what’s important is that we are setting them, talking about them through the week and helping them with this valuable life practice and skill. Their food goals include things like – one sweet treat or snack a day, eat more than 1 carrot stick at a time (it’s funny because they all like carrots and will eat them willingly, but usually only 1 or 2 sticks at a time…maybe it’s a crunchy texture thing?! ), and try one bite of every food on your plate. We generally eat healthy and have healthful foods in the house, which makes this one easier for them to accomplish. Their body goals are mostly along the lines of get out side and get your wiggles out on your bikes or through a trip to the park. Their mind goals revolve mostly around school work, reading time and Ryan’s vision therapy exercises. I highly recommend getting into the practice of goal setting, both for yourself and with your family! It’s a great exercise in communication and building stronger relationships, as everyone works together towards their individual and family goals. Also, later this week I’ll be sharing a post about how you can actually stick to your shopping list when you’re at the grocery store…it should be pretty comical. At least, I’ll be making fun of myself and my grocery store temptations. Onto the free stuff, yeah?! Get started on your family’s Grow Happy goals with this FREE Grow Happy Goals Tracker (pictured above) from KU’s Grow Happy Blog! It’s a fantastic visual guide with tips and tricks that will help you and your family set and achieve bite size goals that lead to healthy life long habits. Also, KinderCare is celebrating their new Grow Happy initiative for better health at their April 15th Open House at all of their community-based child care and early education centers in the country. Stop by for a tour and get free registration when you enroll! Offer good April 13, 2014 through April 20, 2014. Find a center near you and head on over there tomorrow for the Open House event! Disclosure: This post is sponsored by Knowledge Universe. Opinions and family goals are my own.